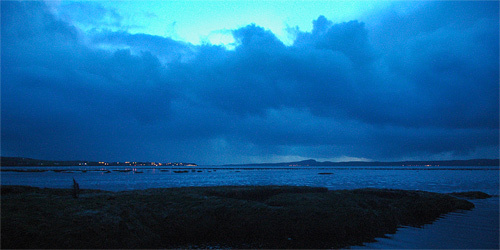 This was at the top of Loch Indaal on a late October evening in 2008. Bowmore on the left, Port Charlotte in the distance in the middle and Bruichladdich on the right. Geese on the roost in the middle distance on the loch. Some brightness left behind the clouds, but fading quickly. As usual I'll post a larger version on the Islay Pictures photoblog on Saturday morning, but for now it's bedtime for me. Good night all, have a great and relaxing weekend!